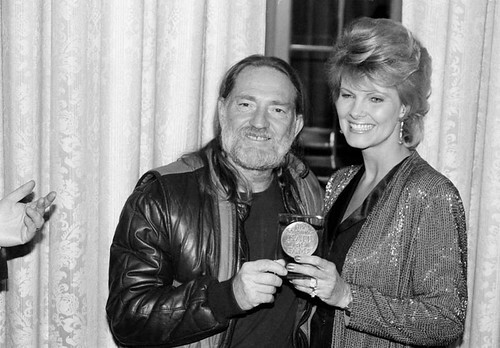 On March 7, 1983, Willie Nelson, pictured here with wife Connie Nelson, received the Lifetime Achievement Award at the Songwriter’s Hall of Fame Awards ceremony in New York City. This entry was posted on Monday, May 20th, 2013 at 7:31 am and is filed under Awards and Honors, black and white, Connie Nelson. You can follow any responses to this entry through the RSS 2.0 feed. You can leave a response, or trackback from your own site.